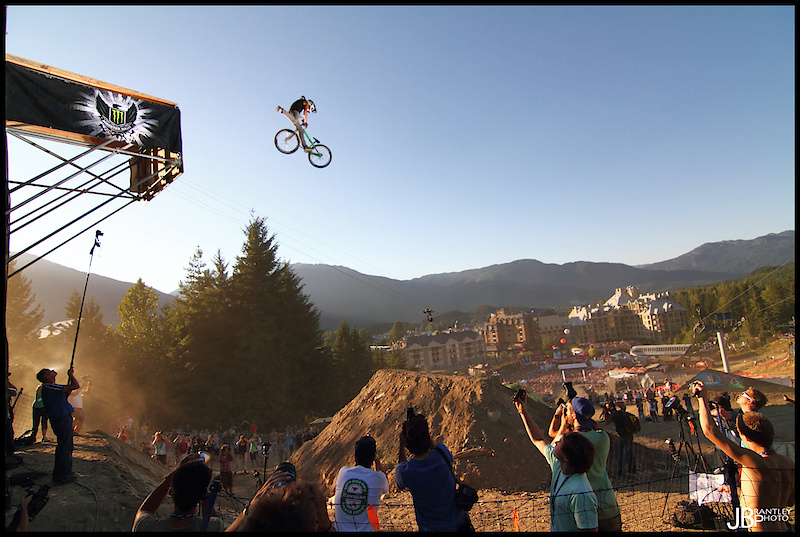 You clearly didn't watch Crankworx and don't have 20/20 vision. You are wrong. This was a tailwhip. I watched it when it happened. Also, whips don't win c-worx. This one really puts it in perspective. i have a deck behind my house that drops away about 30 feet down the hill... every time i see a shot like this i remind myself that these crazy mofos are doing tail whips off it. so insane, such a huge drop. That angle is sooo Sick. Nice shot. i still can't get over how effin crazy that drop is.....and then dude tail whips it so nuts. ummm lets say he did a no-footer, and missed the pedals on landing....... i want that jump!!! This one still needs a POD.. Big Time! does he have wheels anymore? OMG!!!!!!!!! Imagine How scary that would be. Epic timing J.B! does it get much more insane ? This drop looks really big ... and trick ? first. come at me bro. That run was so sick! thats a big drop to tail whip on a hard tail! I wouldn't even do that on my DH rig haha. Screw that! montgomery, you crazy mofo!! just shows how far the sport has progressed. if i saw this 3 years ago, i would have called it a p-shop. how has this not been pod yet? it already has more than 500 fav's? POD cause its fricken huge!!! that pretty high up! why isnt this frickin POD yet?? santacruz-syndicate ^^^ thats what she said!!!! chur, just got myself a new screensaver!